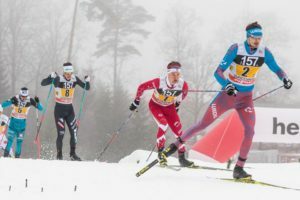 Alberta World Cup Academy stand out Knute Johnsgaard punched his ticket to the 2018 Winter Olympics with a bronze medal performance in 4×7.5 men’s world cup relay Sunday (Jan. 22) in Ulricehamn, Sweden. After watching Devon Kershaw and Alex Harvey ski incredibly well through the first two legs, Johnsgaard skied the third leg of the relay, keeping the Canadians in medal contention before tagging off to Len Valjas, who secured the history-making medal performance. It’s the first men’s relay world cup medal in Canadian history. Remarkably, Johnsgaard’s decision to join the team was an extremely last minute decision. He got the call to fly to Sweden on Wednesday, and raced with only two-days rest. “I just made great decisions. Last week, Canada wasn’t going to be able to field a relay with only three people, so it started with my decision to fly over to Sweden on short notice, arriving late Thursday night. 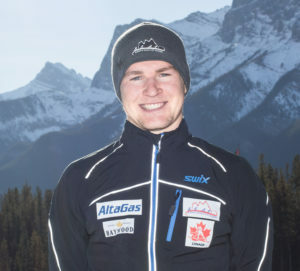 I knew my shape was feeling good training back in Canmore and there was no question the other guys were in shape coming off a team sprint win last weekend,” Johnsgaard said. It was only the second World Cup relay of his career, and the Whitehorse native hung in there with the World’s best. He was never more than five seconds off the pace, as he was determined to stick with the top group. “I knew Len was in good shape so if I could keep contact with the top guys in my leg he could potentially come through for us,” Johnsgaard said. Knute skiing at FIS world cup cross-country, 4×7.5km men, Ulricehamn (SWE) Photo Credit: www.nordicfocus.com. © Modica/NordicFocus. Every downloaded picture is fee-liable. Strategy was the name of the game for Johnsgaard, who knew he had to conserve as much energy as possible before the race. The medal means Johnsgaard will make the trip to the 2017 world championships, and has earned a spot on the Olympic team. This will be his first trip to the games. Johnsgaard has been a standout with the AWCA this season, and has worked hard to adjust to the pace of the World Cup. In the off-season, he likes to take his fellow teammates into the backcountry, where his avid hunting and angling skills have resulted in many incredible adventures. 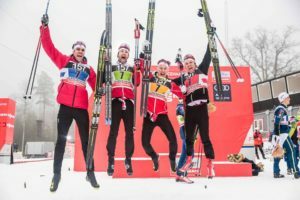 Len Valjas (CAN), Alex Harvey (CAN), Knute Johnsgaard (CAN), Devon Kershaw (CAN), (l-r) – FIS world cup cross-country, 4×7.5km men, Ulricehamn (SWE). www.nordicfocus.com. © Modica/NordicFocus. Every downloaded picture is fee-liable.